The geographical location of Shanghai, combined with its navigable inland water-ways network had, at the time of the first foreign treaties with China, given to the Chinese town, an outstanding position in the coastal, inland, as well as overseas trades. This strategic position had also laid out the foundation for the future growth of this city. At latitude 31 10' and attitude 121 29', Shanghai is located at about the mid-point of the Chinese east coastline. Lying some twelve miles up the Huangpu River(1), Shanghai controls the outlet of Yangtze River - the greatest inland water highway of China (Fig. 1.1a). "The Yangtze Plain is a land of rivers and canals. Probably nowhere else in the world is there an area with so many navigable waterways." Located at the outlet of Youngtze Delta Region, Shanghai was a water town originally. Like other water towns in Jiang-nan area, its land mainly composed of cultivated plains, lakes and water-ways. Within the city, five water-ways connected to Su-chow Creek and Huangpu River. The 7000 bridges in total built in the city, with some as pedestrian only, some others served for vehicles and bicycles, can also indicates the dense water networks within the city. This characteristics inherited in its natural geography would inevitably influence the civic structure and urban planning of the city. Talking about land transportation, Shanghai is also the meeting node of two major north-south railway-lines developed after the Liberation: the Beijing - Shanghai Line and the Shanghai - Canton Line (Fig. 1.1b). The railway system, combined with waterway network, connects Shanghai with immense territory of western, northern and southern China. Hence, Shanghai, being the crossing node of the sea, river and land transportation, took on a superior geographic position which had caught the attention of the European travelers in 18th century. Shanghai's climate is influenced alternately by cold dry air from inner Asia and Siberia from the north and north-west, and by warm moist air from the Pacific Ocean from the south and south-east. It is tropical for one-third of the year and temperate for two thirds. Rainfall averages 1,200 mm annually, most of it falling during the spring and summer, without very marked seasonal concentration (Murphey, 1953, p43). The period from October to February is comparatively dry with clear skies and stimulating temperatures, making this the most pleasant season of the year (Fei, 1939, p11). Winter temperatures seldom drop to below freezing, hence Shanghai is the only port city that free from ice at all seasons among all ports in northern half of China. Owing to the southerly latitude, the summers are subtropical with temperatures which frequently rise to 38C. The average maximum temperature in summers is 37C, and the average minimum temperature in winters is -7C. The Yangtze Plain has climate conditions which are favorable for agriculture during most of the year so that the growing season lasts for about 300 days. As a result of advantageous transportation and favorable natural conditions, Yangtze Delta Region gradually became the richest part in terms of agriculture and commerce, and most advanced area in terms of economy and technology among all Chinese regions. "Ample level ground was useful during the purely commercial phase of the city's development in allowing adequate space for storage of goods, for half of China's foreign trade passed through Shanghai from 1865 on, but it was more important in allowing the development of manufacturing after 1895" (1953, p.43). In sum, the commanding position of this region in Chinese economy is due partly to its superior natural environment and partly to its favorable position in the system of communications. Being a coastal region, it has become more and more important since the development of international trade by ocean transport. Shanghai, the sea-port of this region, has developed into the biggest metropolis in the Far East in the late 19th- as well as in the early 20th-century, and it hence dominated a large part of Chinese commerce and trades internally and externally. About four to five thousand years ago, the early Chinese had already developed good skills in fishing and hunting. Later they adapted to agricultural economy and had established a number of settlements in this region. With the seaward extension of the Yangtze Delta, new coastal flats were gradually formed, and these settlements also extended eastwards. By the fourth and fifth centuries AD, during the Eastern Jin dynasty, the Song River (present-day Su-chow Creek) was already known for its prosperous fishing industry. During the period of the Northern and Southern dynasties (5 - 6 AD), the political focus of China shifted to the south, resulting in a southward migration of people from their original northern territory, brought about with them more advanced farming techniques. 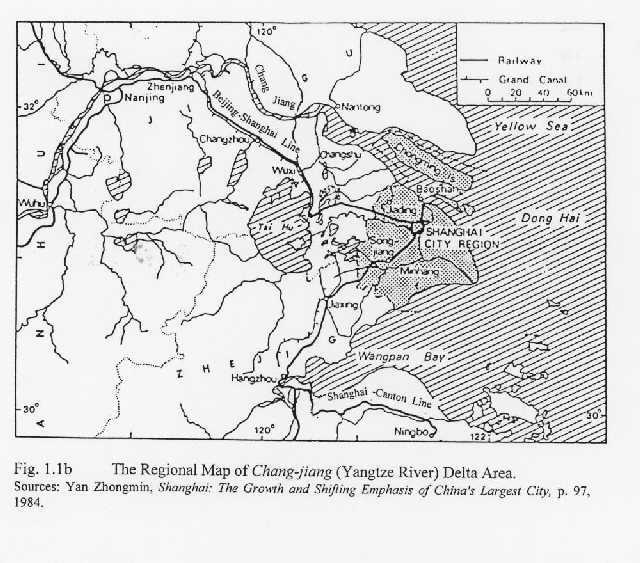 During the Tang and Song dynasties (7 - 8 AD), large-scale civil projects were undertaken in the Yangtze Delta to improve the use of inland rivers, while shallow sea inlets were dammed and turned into storage reservoirs. 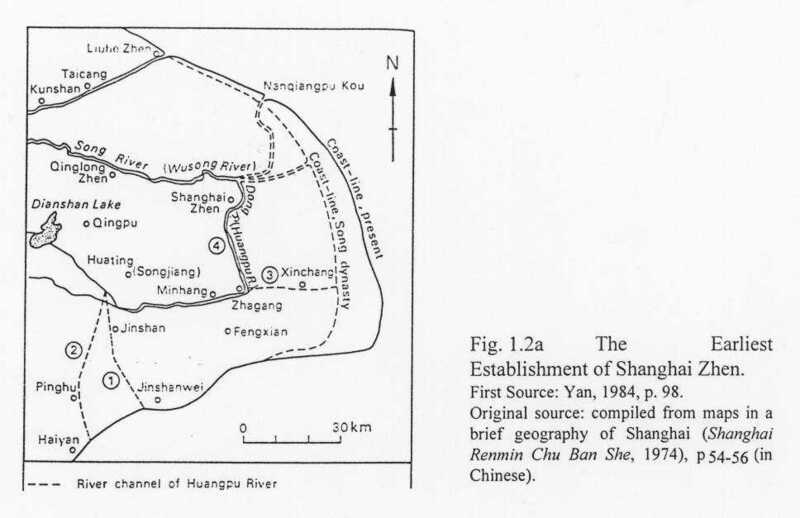 Irrigation and river transportation were enhanced, and a rapid development of fishing, salt extraction and farming with a concomitant growth in population, commerce and external trade took place (Wang, 1989, p16). (which is administrated by Shanghai today). In the tenth year of Tian Bao, Hua-ting Zhen (the Fortress of Hua-Temple) was established in present-day Song-jiang Xian (another Xian administrated by Shanghai)(Yan, 1984, p.98). The establishment of Zhen marked the growth of this region and the recognition of its political and economic importance by the central government (Fig. 1.2a). , flowed northwards into the Song River (Su-chow Creek) to the east of Hua-ting Zhen, and many sailing vessels unloaded their goods there. Subsequently, the spot came to be known as Shanghai Zhen (Fig. 1.2b). During the 13th century, Shanghai Zhen replaced Qing-long Zhen and became the major port town of this region. Soon after, it was declared an official administrative Zhen, marking the first appearance of Shanghai as a city. Both its population and its commerce flourished rapidly. 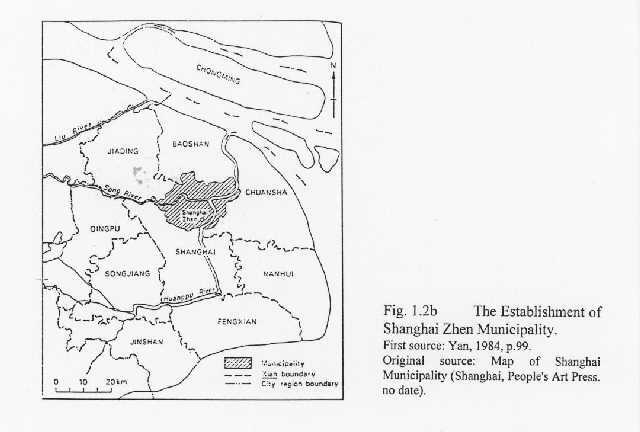 In the 29th year of the Yuan dynasty (AD 1292), five villages were separated from Hua-ting Zhen to form a new Shanghai Xian which covered the present central area of the city(Yan, 1984, p.99). The newly formed Xian boasted a population of about 300,000, a large number of whom were engaged in shipping activities. Till this stage, Shanghai Xian, well-developing a system of commerce and trade, had gained its position as the leading port and economic center in the Yangtze Delta region. After the establishment of Shanghai Xian, fishing and salt-extraction industry were the mainstays of the economy in this area, but they were gradually replaced by commerce and trade as navigation was further developed. Ocean trade started. But in the mid-16th century, Shanghai Xian had been frequently attacked by pirates along the coast and this led to the closing of the coastal areas to trade at one time, which resulted in an absolute decline of the port economy and the Xian's population. After years of fighting and finally annihilating the pirates' invasion, the ban on coastal trade was lifted in 1685. The following year, a Jiang-Hai (River and Sea) Customs Office was established along Huangpu River, collecting taxes on dutiable goods carried by ships passing-by. The economy and commerce of Shanghai became active once more. (Wang, 1989, p16). The mainstay of the economy during this period was local industry, e.g. cotton textiles. In 1842, the year before Shanghai became a treaty port, it already had a population of 550,000. It had developed a number of important shipping routes: the northern routes to Yingkou, Shannon, and Yantai; the southern routes to Zhejiang, Fujian, Taiwan and Guangdong; the western routes to the ports along the Yangtze River; and numerous other routes which made use of the Su-chow Creek, the Huangpu River and the Grand Canal connecting Shanghai with other coastal provinces. Although Chinese foreign trade was at that time confined to Canton, overseas Chinese shipping lines were allowed to operate between Shanghai and Japan, Shanghai and Korea as well as Shanghai and Southeast Asia. The principle port area consisted of a semicircle along the Huangpu River, extending from the present South Pier to Shi-liu-pu (Yan, 1984, p.100). The commercial center, started in an area of 43 acres along the Huangpu River and demarcated by Su-chow Creek, was able to grow outward toward the west, south, and north if both political and economic factors provided conditions for metropolitan industrial development. Before it was open as a treaty port, Shanghai was already very active and prosperous in trade and commerce. to sign the Treaty of Nanjing in 1842, which granted invaders with privileges to live and trade in China. These privileges included that: British subjects and their families, and those of countries like France and America who signed similar agreements with Peking (Beijing), could live and work in the treaty ports, could own property, and could provide themselves with certain physical and spiritual amenities (Clifford, 1979, p16). In 1843, under the agreement of Nanjing Treaty, Shanghai became one of the five treaty ports. Shanghai was turned into a colonial city and was consistently under control of a compound of foreign countries, leading among them were Great Britain, France, America and Japan. To their interest, the foreign capitalists took advantages and expanded the treaty as far as they possibly could. They manipulated Shanghai's industry and economy, established banks and financial institutes and used them as levers to control the economy and politics of China. The colonial situation of Shanghai lasted for about one century (1842 - 1949) until China was liberated by the Communist in 1949. According to the stipulation, land was laid out in suitable lots for lease, and long-term lease was granted at the same time to the land owner - the foreign subjects. The subjects were allowed to lease their property to other foreigners as they wished, and later on, even to Chinese. The land renters were to agree together about contributing towards the common expenses such as laying out and repair of roads, building of bridges and drains, and providing public markets and amenities, etc., (Jones, p4). From viewpoint of foreigners, they thought this system was beneficial to both sides and shouldn't be regarded by Chinese as being in any degree an invasion of Chinese sovereign rights; on the contrary it was in complete harmony with the idea of the devolution of responsibility which lies at the root of all Chinese administration, since some public amenities such as good roads and clean surroundings were, at that time, that the Chinese government did not value or were not able to provide. 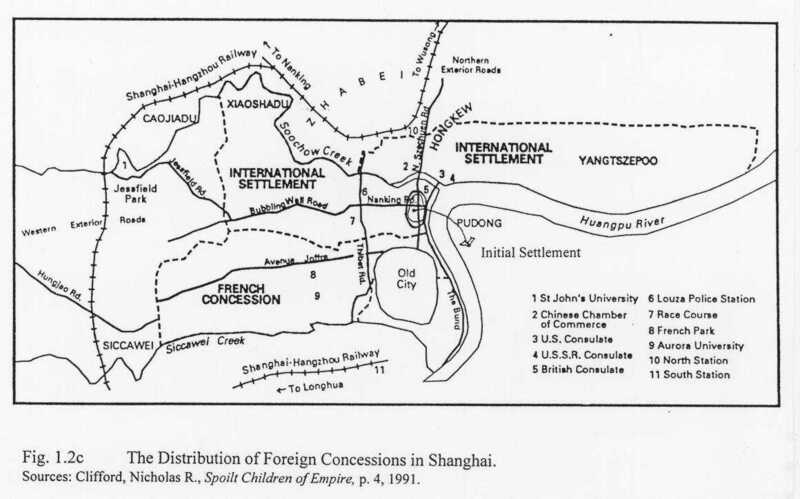 During the colonial period, four foreign countries had dominated the control over Shanghai, and each had established its own land and its independent administration. They were the French Concession, the English Concession, the America Concession, and the Japanese Concession, the last one appeared in very late stage. Later the English Concession combined with the American Concession and formed a common administrative district as the International Settlement (Fig. 1.2b). The provision of extra-territoriality in concessions and settlements had afforded a higher degree of security for life and property and offered more effective protection from excessive taxation or illegal exaction than was available in areas under Chinese control. Far more investments were made into the concessions and they were subsequently rapidly developed. Offices, banking and financial institutions were erected along the Bund, where the concessions were initiated. Even today, as a landmark of Shanghai, the Bund is still renowned for its European styles of architecture which indicates the past presence of foreign powers (Fig. 1.2d). Shanghai was used as a beach-head for further aggression into China by foreign capitalists. They controlled Shanghai's customs offices, established banks, factories and trading houses, monopolized a large portion of its financial and import-export activities. Further more, they snatched the rights to navigation in the China seas and up the Yangtze River. Shanghai was used as the center of a huge navigational network that included a number of international routes to Hong Kong, Japan, South-east Asia, India, Europe, the United States and Australia. It also became the dumping ground for excess foreign products and the exit point of raw materials and other supplies from China to their home markets (Yan, 1984, p101). The annual range of ships calling at Shanghai climbed steadily, from 8,485 tones in 1844 to 37.65 million tones in 1936. The exports were mainly silk, tea, agricultural and mining products. The imports were dominated by cotton goods, woolen knitwear, luxury goods, and a fair proportion of opium. From the 1870s until liberation, Shanghai dominated China's foreign trade. It consistently accounted for about 50% of China's total foreign trade(Yan, 1984, p101). Financial institutions of Shanghai were by-products of its trade. However, foreign capitalists made use of them as levers for controlling Shanghai and even the whole of China. Since the 1850s, a number of foreign countries opened a total of 68 banks in Shanghai. Later on, local banks with bureaucrat-capitalist and national-capitalist origins were also established. Most of these had their main offices in Shanghai (Yan, 1984, p102). Shanghai had in consequence become the chief banking and financial center as well as the chief shipping, commercial and industrial center in China and ranked among the top ten important commercial ports in the world. Among China's foreign settlements, Shanghai was unique. It was far larger and far richer, and ultimately far more important to the home countries of its inhabitants. In other ports, though foreign settlements perched on the edge of great Chinese cities; they did not dominate their cities. Foreign Shanghai had started out this way too, but by the beginning of the twentieth century it had overpowered the city of which it was a part. The International Settlements and the French Concession accounted for over a million of its inhabitants and included by far the greatest part of its wealth, commerce, and industry (Clifford, 1979, p7). cities such as Su-chow, Nanjing, and Hangzhou, brought their wealth and cultural tastes with them. New styles of life began to appear in Shanghai's concessions, and many of them had come to regard Shanghai as a new home. Then, the development of light industry and commerce induced a second type of immigration from the countryside. Tens of thousands of able-bodied poor villagers from Jiangsu, Anhui and Zhejiang Province were drawn to the city in search of job opportunities. In the census taken by the new government in 1949, Shanghai employed at that time a total of 840,000 artisans and industrial, construction, and transportation workers in addition to 370,000 shop clerks and apprentices. The third and most dramatic increase in Shanghai's population took place between 1937 and 1941, when Sino-Japan war broke out and Japanese troops occupied coastal China. The foreign concession, as "lone islets" in a sea of Japanese invading forces, became refuge camps for thousands of Chinese, no matter rich or poor. The population of the foreign concessions reached a total of 2,430,000, a gain of 780,000 from 1937. The push of social disturbances in surrounding area and the pull of economic attraction in concessions thus combined to alter the social geography and demographic profile of Shanghai in the century after the Opium War (1842-1949). 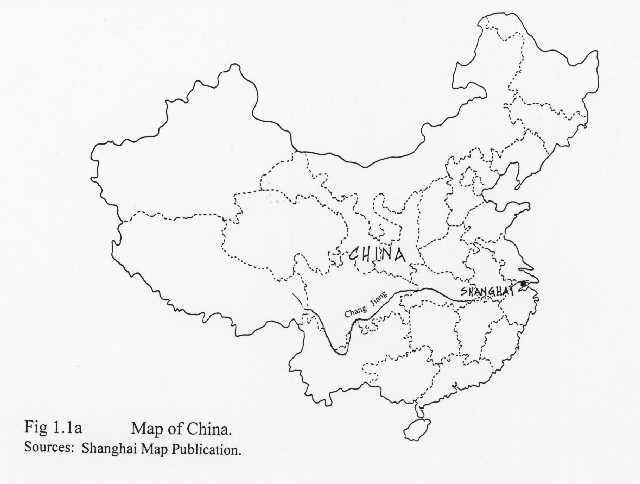 While in the 1840s, less than 1 percent of Shanghai's population was to be found outside the old China town, in the 1940s no less than 65 percent population were residing and employed in the two foreign concessions, which together comprised less than 6 percent of the total geographic area of metropolitan Shanghai. Modern Shanghai was very much the product of the Western invasion of China in the nineteenth century. The manipulation by foreign capitalists made the city of Shanghai develop a character of extreme complexity among its various domains - economy, industry, society, culture and religion. The city's sophistication was further reinforced by its rapid urban growth accompanied by the arrival of thousands of immigrants from many parts of China, each group attached to another profound background. The complex background eliminated and denied the city itself an environment of cultivating a tradition which was naturally grown based on its own. In fact, "foreign Shanghai" has become the city's tradition and heritage. It is assumed that many facets of architecture and urban planning principles during this time (1842-1949) were open to the intense foreign influence. 1. 1 Which runs into the estuary of the Yangtze River. 3. 3 A Xian is also a county, but its size and administration domain are both larger than a Zhen. 4. 4 Later on, this river channel had gradually combined by Huangpu River. 5. 5 The last fudal government in Chinese history. 6. 6 The southeast part of China.